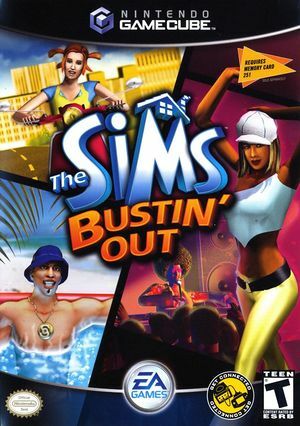 The Sims: Bustin' Out is the second title in The Sims series. 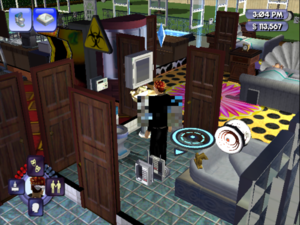 As the title suggests, the Sims can get out of the house to visit other locations such as Shiny Things Lab or Casa Caliente. There are two modes. 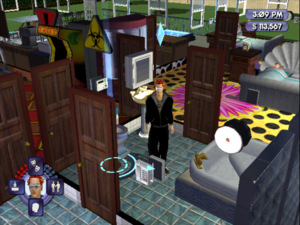 Bust Out Mode which has mission based gameplay and Freeplay Mode which is open-ended gameplay very much like the original The Sims PC game. The 1st player's screen glitches and is overlapped by the 2nd player view. Under Direct3D, when active, the censor effect can cause slight graphical corruption. It will return back to normal when the censor effect is no longer on-screen. It can even crash Dolphin after a message box about "CreateTexture failed". Use OpenGL to avoid this problem. Fixed some time before 5.0-2462. OpenGL Censor effects have slight issues under Direct3D. The graph below charts the compatibility with The Sims: Bustin' Out since Dolphin's 2.0 release, listing revisions only where a compatibility change occurred. This page was last edited on 27 February 2018, at 11:45.